When my sister and I were young we would lock ourselves in the bathroom and play scientist. At the time my father was a chemist. He would bring home test tubes and beakers for us to play with. We would mix mouthwash and shaving cream or whatever we could find in the bathroom closet like mad scientists until our mother would scold us from the hallway telling us to stop wasting dad's shaving cream and put the cap back on the toothpaste. I guess those early days trying to make a chemical reaction is when my love of baking began. While cooking is an art, baking is a science, as well as a labor of love. 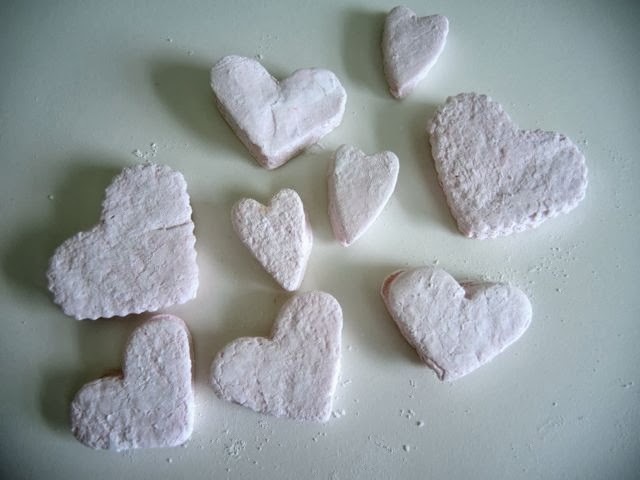 With cupid about to launch his arrows what better way to celebrate the chemical reaction of love than with a batch of homemade raspberry marshmallows. After all marshmallows are just a chemical reaction between gelatin and sugar syrup. When we were in Paris this summer we bought pastel-colored marshmallows or guimauve, as the French call them, at Hediard. I was intrigued how this lowly confection was elevated to an art form. I had never made homemade marshmallows before. It was time to give it a try. I found it isn't hard. It is just a little messy. If you approach it with childhood curiosity it is a whole lot of fun. Do make sure to have everything ready before you begin as the marshmallow mixture sets up quickly. You can pipe the mixture or spread it on a pan and when set, cut into pieces with a knife or cookie cutter to create shapes like hearts or snow flakes. 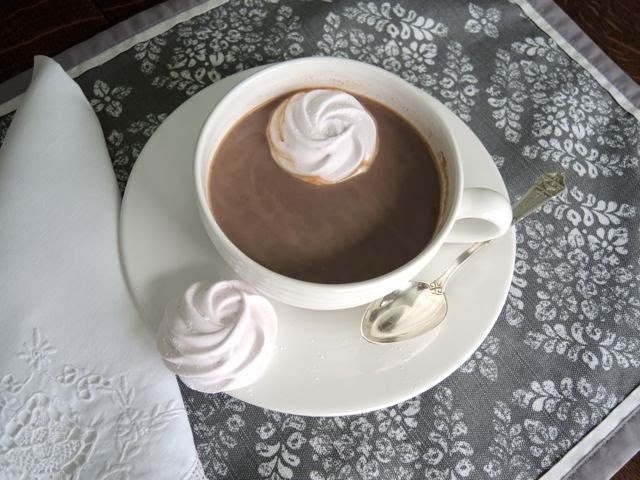 With Valentine's Day near and our brutal winter hanging on I combined deep, dark hot chocolate with fluffy raspberry marshmallows to share love and warmth and brighten our lives. Making the marshmallows made me feel like that mad scientist of my youth. I let the raspberry purée gently color the marshmallows. The color is very pale, which I prefer. If you want a stronger pink add red food coloring a drop at a time when beating the marshmallow mixture until you reach the desired color. 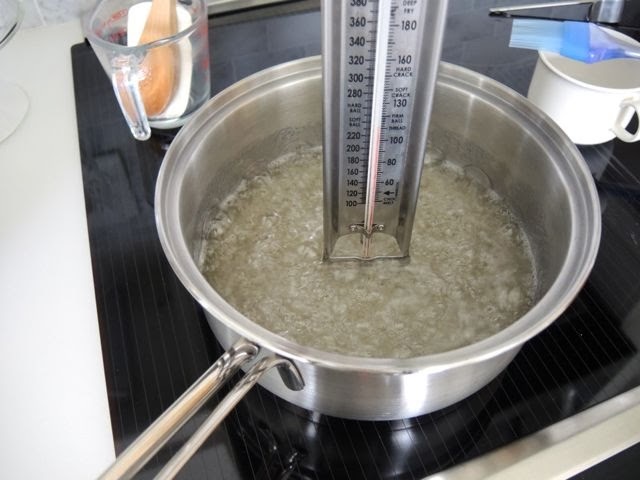 A sturdy candy thermometer makes this recipe easy and guarantees perfect results. Once the mixture is light and fluffy work quickly as it starts to set up fast. I piped a tray of double rosettes. (Apologies to my pastry teachers Kelly and Peter for the rosette imperfections as I was working very quickly.) 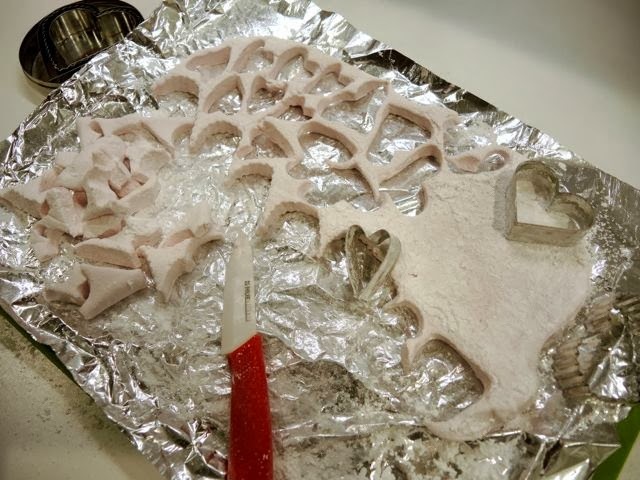 I then spread the remaining mixture on another prepared tray to cut out heart shape marshmallows. Make sure to use plenty of powdered sugar (my preference) or corn starch to keep the mixture from sticking as the cut edges stick to everything. Once the mixture is firm flip upside down on another piece of foil that is generously dusted with powdered sugar or corn starch. Gently remove the foil from the flipped side before cutting into shapes. 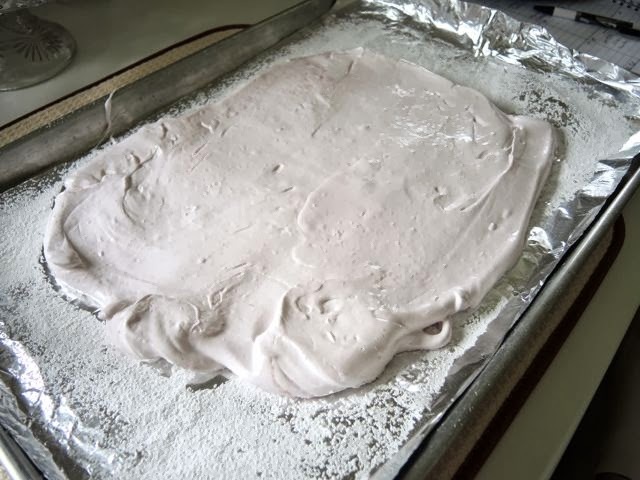 Dredge marshmallow pieces in powdered sugar or corn starch before storing in an airtight container. 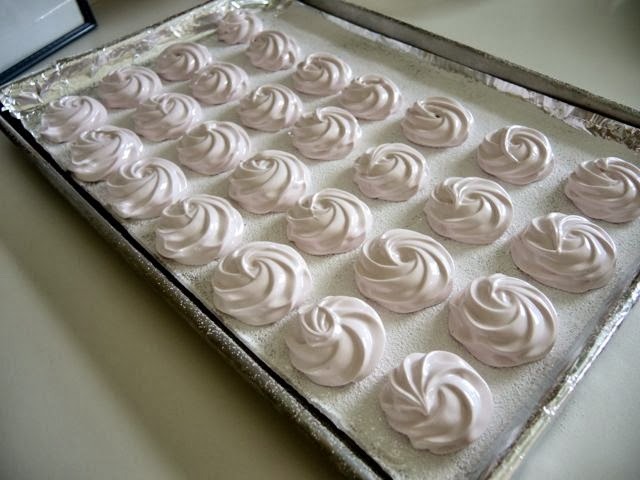 Marshmallows will keep up to two weeks or longer if you omit the egg whites. The scraps are good for nibbling. You can leave out the egg whites if you prefer, the recipe will work just fine without them, However, they greatly enhance the flavor. Prepare a pastry bag with a large star tip and set aside if piping the marshmallow mixture. Cover two sheet pans with aluminum foil. Sprinkle each generously with 1/2 cup (65 g) powdered sugar or corn starch making sure to get good coverage. If spreading the marshmallow mixture have a large offset spatula handy. Lightly oil with vegetable oil or non-stick spray. 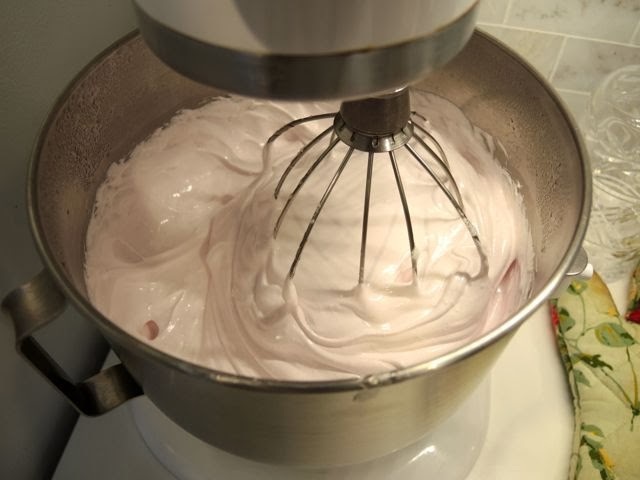 If using egg whites - while the sugar syrup is cooking, beat egg whites and salt in a separate bowl with a hand-held mixer until they form stiff peaks. Set aside. 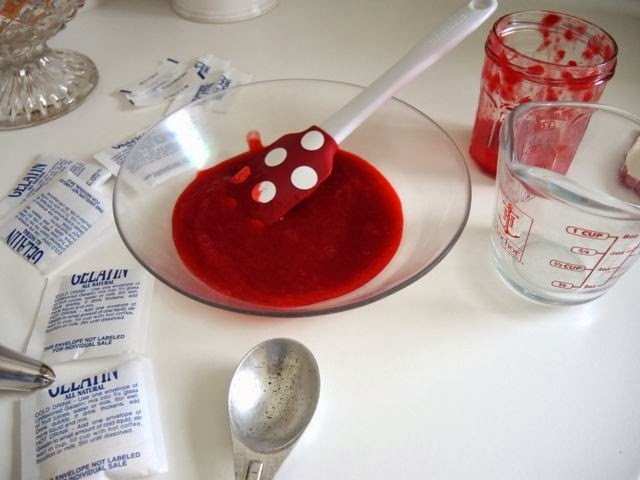 When the sugar syrup is ready turn the mixer on medium-low speed and very slowly and carefully pour the sugar syrup down the side of the bowl to avoid burning the gelatin and splattering the hot syrup. Once all syrup is incorporated raise the mixer speed to high and beat until mixture doubles in volume and becomes light, fluffy and very thick. Add the egg whites, if using, mix to incorporate. Fill a pastry bag and pipe desired shapes, such as rosettes or 'kisses', on prepared pans. Or spread on prepared pans and smooth with a lightly oiled offset spatula. Work quickly as the mixture will begin to stiffen very fast. Let sit to dry for at least 4 hours or over night. If you piped the marshmallows, once set peel off of the foil and dust with additional powdered sugar or corn starch. If you spread on a cookie sheet cut in squares with a knife or cut into shapes with cookie cutters. Spray the knife or cookie cutters with non-stick spray to keep from sticking. Dredge the cut pieces in powdered sugar or corn starch to keep them from sticking together. Store in an airtight container, such as a tin, for up to two weeks. They will keep longer if you do not use the egg whites. 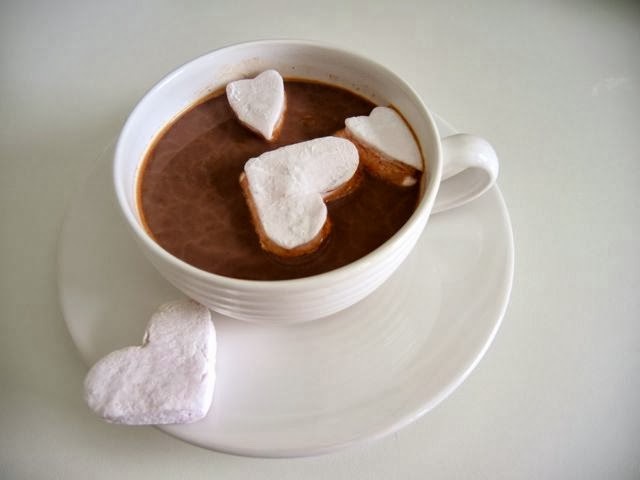 I prefer my hot chocolate to be more chocolate than sweet, plus the marshmallows add a good dose of sweetness, but feel free to increase the sugar to taste if desired. You can double the hot chocolate recipe to make 4 servings or drop in half to make a single serving. Stir cocoa powder and sugar together in a small glass bowl. Scald milk. Add a few spoonfuls of scalded milk to the cocoa mixture stirring to make a paste. Add more milk until the mixture is thinner and there are no lumps. Then stir the cocoa mixture into the rest of the hot milk. Use an emulsion blender if desired to further blend the mixture. Serve with raspberry marshmallows. Makes 2 servings.